CD review: "A Matter of Time"
This review first appeared in the August 28, 2008 issue of the North County Times. 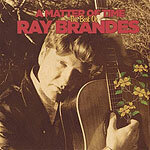 What's most apparent about listening to the new "best of" collection showcasing the two-decade-plus career of San Diego rock singer Ray Brandes is how grounded in '60s mod stylings has been every project he's tackled. From his early work as lead vocalist for '80s mod revivalists The Tell-Tale Hearts through a short stint singing for fellow local modsters The Shambles to a series of other projects in the years since, Brandes' singing consistently hearkens back to the mid- and late-'60s Brit sounds. That still takes in a broad swath of rock 'n' roll, though, with influences ranging from Herman's Hermits to the Who to fellow revivalists The Jam. On his earlier tracks, with The Tell-Tale Hearts and The Shambles, there's definitely a focus on softer pop-oriented material. As he started moving into the mid-1990s, though (the 24 tracks are laid out chronologically), his music began adding more punch, more of an edge, before returning to the pure melodicism of his early years on his last few sessions. What's also apparent is that it's only a missed break here and there that kept Brandes from hitting the big time on the national scene. He's got all the ingredients  a great voice, a solid presence behind the mic, and the ability to turn out little gems of pop music. Fans of The Tell-Tale Hearts will appreciate the inclusion of "Come and Gone," which is not on the band's "High Tide" anthology. Fans of the San Diego scene in general will dig how many local stalwarts he's played with through the years, from Gregory Page (Rugburns) to Rick Wilkins (Buddy Blue Band, Sara Petite & the Sugar Daddies, Outriders) to Bart Mendoza (The Shambles) to John Kuhlken (Sara Petite, Julie Mack). But you don't buy this CD as an artifact of the local scene; you buy it because it rocks.